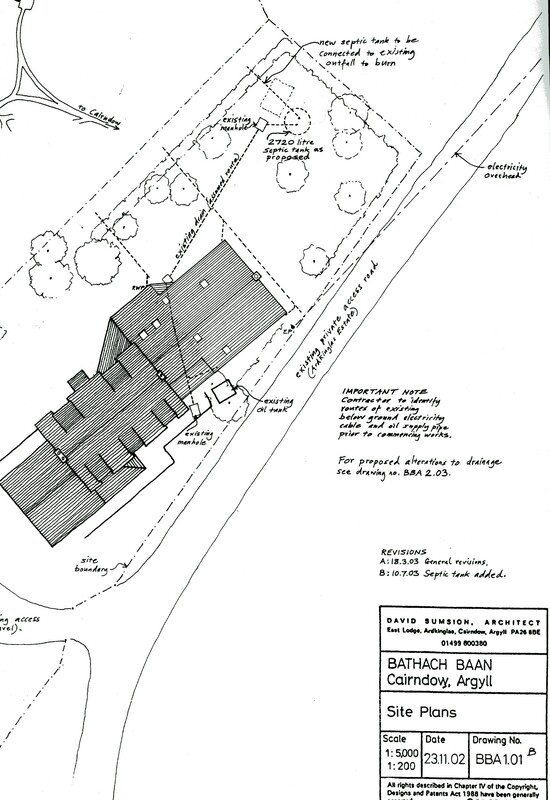 Bathach Barn cottage is now quite a substantial house of one and three quarter storeys. It is north-south aligned with its western frontage facing Loch Fyne. 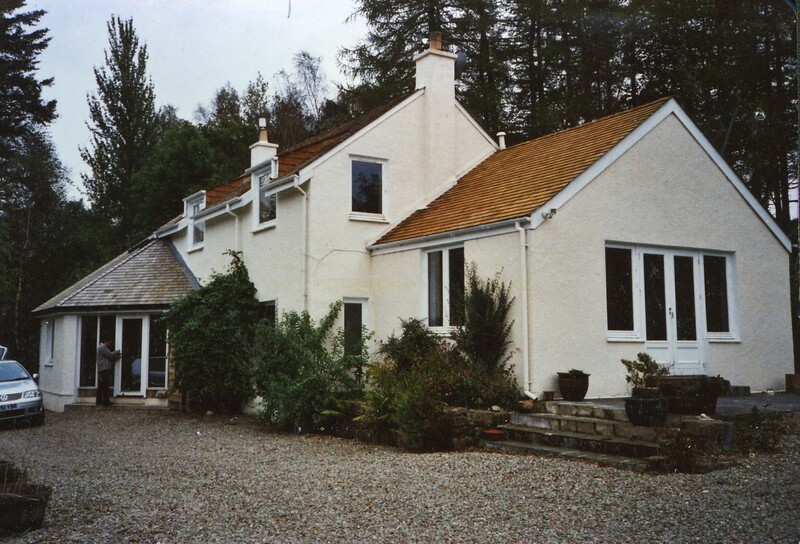 This house has seen many and repeated extensions, rebuildings and remodellings but appears to have started life as a single storey two roomed cottage – a structure that still forms the heart of the present house incorporating as it does the existing kitchen, stairwell in the main part of the house and living room. The house is now owned by Jackie Davies and Mark Edgar. To the exterior bounding the west side of the present plot is a small burn course which has been revetted on each side by three or four courses of substantial fieldstones, apparently dry laid, though clearly of some age. This is apparently a diversion of the pre-existing burn course that runs diagonally to the north-west/north-north-west across the field beyond. 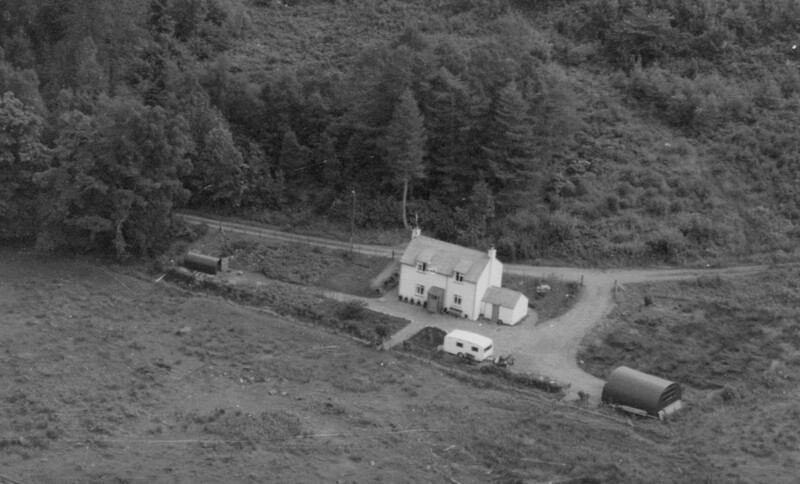 An aerial photograph, dating to the 1970s, shows that there were two Nissan huts – one larger and one smaller set within the existing plot. The larger hut was placed to the south-west and the a smaller one to the north. The larger one still survives and is of semi-circular construction painted green. This had apparently come from Arrochar, but may itself have been relocated to Arrochar perhaps from the encampment at Inverary in the policies of Inveraray Castle. 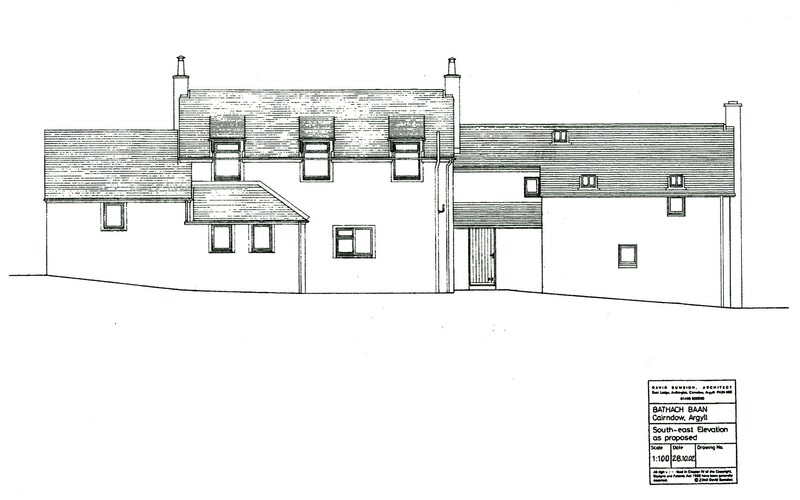 The original cottage building could possibly be identified on the First Edition Ordnance Survey Map (6 inch, surveyed 1870) that shows a building aligned E-W.
Externally on the east side of the building, the outline of the original wall can still be seen. The wallhead is about two metres above ground. Internally, where there has been some remodelling parts of the early walls of the cottage are visible and in some areas render etc. has been stripped back to masonry. This is most obvious at the north-west corner where the exterior corner can be seen. The corner itself formed of rough hewn long tailed slabs of local schist. This is very well-built and on the original north gable wall to the northwest can be seen the beginning of the gable of the early cottage itself rising diagonally up. The entire early building appears to be wholly constructed of local rubble, mixed stone, schist etc. Internally, within the living room (lower sitting area), part of the east wall is visible and where visible the lime mortar employed is very white-creamy with medium-coarse riversand as an aggregate. In the west wall within the living room, is exposed the remains of a cruckblade which is jointed at the shoulder. The post of the cruck survives intact and the first part of the raft of the blade above the joint still remain, but is sawn off a little bit above the joint. The joint still retains on the room facing side to the east, the evidence of three peg holes running through – two of which still retain pegs within. The surviving top of the wood is patched over with lime mortar which indicates that the cruck frame roof structure was removed at a relatively early stage and perhaps the wall heads were built up slightly and then the new roof structure put in place. This evidence of the lime mortar indicates a second major historic phase of construction, likely a rationalisation of the earlier very vernacular building into something perhaps much more up to date and more commodious upper storey. The spacing of the cruckblade is about a third of the way along the west wall and would seem to indicate a three-bay structure for the roofing. This means one further pair of cruckblades would be expected to have existed further to the north. Within the living room / lower sitting area in particular where the wall head is visible it seems likely that there had been an upper storey, possibly even at both periods of the early building. In the original north gable wall, which is now within the existing kitchen on ground floor, there is a central recessed area and this may be a remnant of an early arrangement such as a fire hood or a chimney breast, but this has now been removed. Within the early part of the cottage complex, the kitchen and smaller living room / lower sitting area are separated by a stairwell that rises up from close to the original entrance (porch used as larder) and this may well reflect the 19th century interior arrangements whereby the stair rose up to access two large rooms on either side to the north and south of the upper level. This was certainly the arrangement when the structure was rebuilt in the 1970s (see below). The upper room to the south still reflects this original arrangement. It is one single master bedroom now. 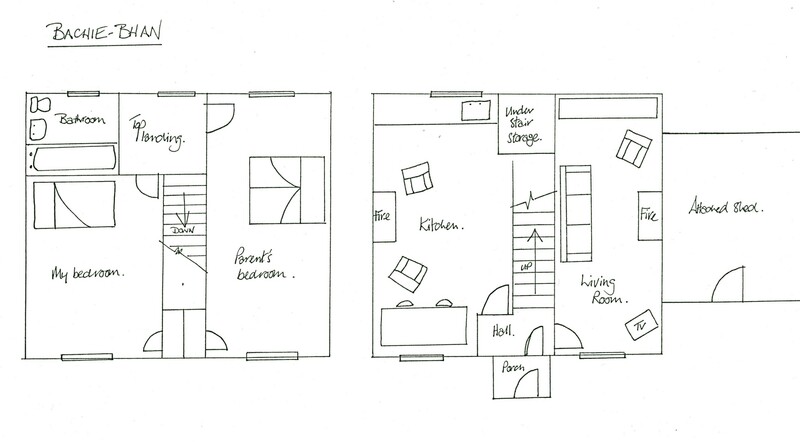 At some stage subsequent to the 1970s work discussed below, this area was subdivided by partition walls into an entrance vestibule at the head of the stairs that led directly to the south to a small child’s/box bedroom and to the southwest, to a more substantial bedroom occupying the entire south-west part of the upper level. These partitions were all subsequently removed once again and the interior formed into a single chamber, which most likely represents the original layout. At the head of the stairs on the north side directly ahead there is a small bathroom and to the west an entrance leading into a further bedroom. Whatever the further details and form of the early building were, it is clear that the structure was heavily remodelled subsequently. The building was apparently abandoned in the mid 1950s and remained ruined thereafter until its renovation in the early-mid 1970s. An aerial photograph exists that shows the newly renovated building at this stage, which still forms the core of the present house. After this renovation the structure consists of a one-and-three-quarter storeys under a double pitched roof which is cedar shingled. This appears to be the original detail from the 1970s and one that has been perpetuated for all the subsequent roofs as well. Presently, the external wall faces are harled with cement and painted cream. At first floor level there are three dormers on the east side and two on the west side. These dormers each have a catslide roof and shingled sides. There are plain cement rendered chimneys in the gables to the north and south and the 1970s aerial photograph shows that the principal entrance was in the centre of the west wall where according to the early photograph there was a small porch with an entrance to the west and a small lean-to roof. The porch appears to still survive but has been converted into a larder accessed internally only and entirely clad with shingles externally. The early photograph also shows a small single storeyed extension on the centre of the south gable, this with an entrance in its west side underneath a shingled double-pitched roof. The two chimneys at the apexes of the gables rise upon chimney breasts that project out on the exterior wall faces. These are surmounted with a cement slab coping and pale terracotta cans above. 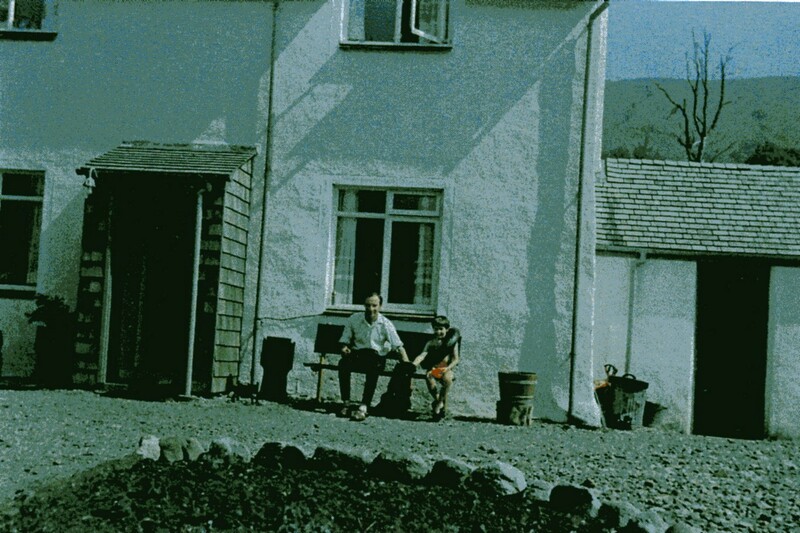 In about 1986-7 a large new single storeyed extension was added to the south gable and an opening broken through the S wall the original cottage. A pre-existing fireplace opening, possibly associated with the earlier extension (no early surround surviving) was modified at this stage for a new wood burning stove that was broken into the earlier flue in the south gable. The stove sits within the new extension at its northwest corner. The angle in northwest corner has been filled in with the flue arrangements for this wood burning stove. In front of this is a hearth area that is slated. Internally the extension contains a single room under a low pitch barrel vaulted ceiling and is accessed from the main house (lower sitting area) by a short flight of five steps up. Internally, the north wall, which is the south wall of the earlier cottage, is rendered up in cement otherwise the walls are lined out in plasterboard and the whole is painted in a mustardy-yellow, the ceiling is white. The floor is of birch. The extension is slightly offset to the east and rises under a double-pitched shingled roof. There is a large patio door with flanking windows to the south and a further arch window in the west wall and a small window in the upper part of the east wall. 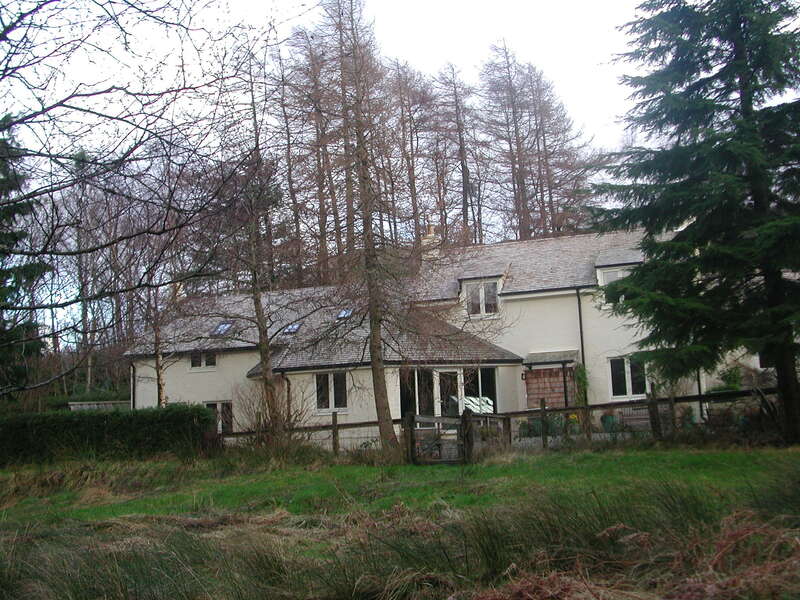 The range is cement rendered externally and painted cream. The patio doors lead to two steps and onto a slate surfaced patio area beyond. The extension extends beyond the line of original east wall and the re-entrance is infilled by two small utility rooms – a small vestibule and a shower room. This has a lean-to roof rising up to the original east exterior wall of the first building. These additions were built by John MacDonald. To the north of the original cottage, the house has seen two further extensions. These are both designed by David Sumsion and built by Fergusons of Strachur. The first northwards extension was apparently built in 2001 and includes a glazed wrap-around conservatory that provided an access area linking the original building by means of a broad slapping that occupies the northern part of the west wall. It now links directly into the existing kitchen. The canted section of the wall in front of this is fully glazed and contains what is now used as the principal entrance and this leads around to the north-west to a small dining table area with windows to the north and west. 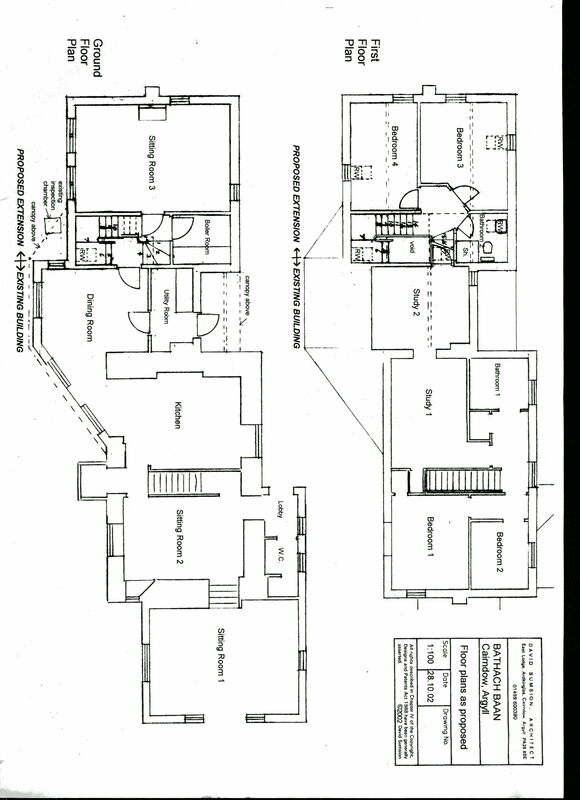 The dining area links through to a utility room to the E and a rear porch. The rear porch is a most recent secondary addition to the 2001 extension. The utility room is plasterboard-lined while the dining room is matchboard lined on the walls, with wooden floor and plasterboard ceiling. The woodwork of the windows and architraves is all of pine. The door through to the rooms further north is of oak. All of these northern extensions seem to be block-built and harled over with coarse cement and painted cream. Over this is a double pitched cedar shingled roof. The first of the two extensions was built in 2001, the second in 2003. The 2001 extension has an upper storey whose rooms rise up into the coombing of the roof space and these are lit to the west by skylights. The upper bedroom was broken through into the pre-existing house through the original north gable wall. 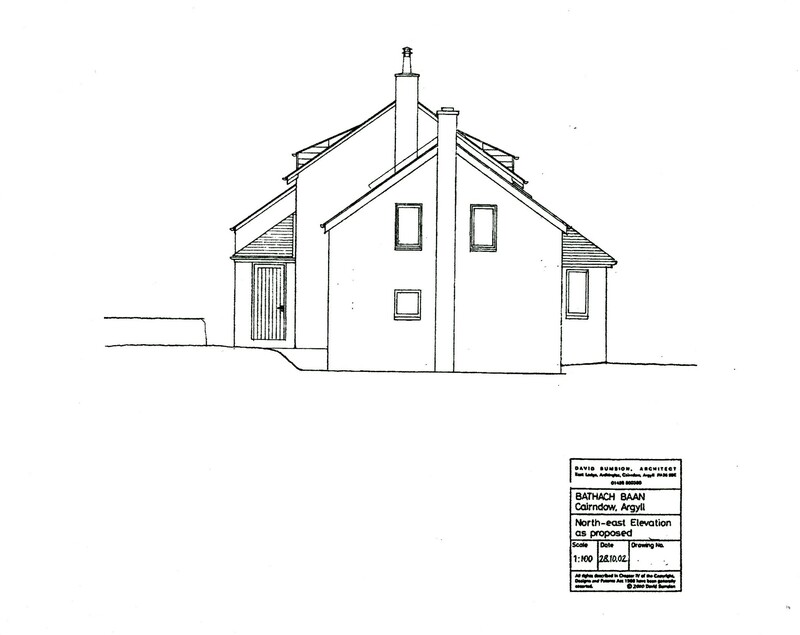 The 2003 extension is more substantial than the earlier extensions, it is of one-and-a-half storeys, but relatively deep in plan. Its double pitched roof is a continuation of the 2001 extension and the whole is rendered roughcast cement and white painted as elsewhere. Beyond the dining room a new entrance leads to a pine stairwell of the 2003 extension. Then beyond this, five steps lead down into a large living room that occupies the entire depth of the ground floor of the 2003 extension. The latter is of boarded V-section woodwork internally. There is a fireplace in the centre of the north gable. This is formed of brick with a small arch and a wood burning stove below and mantle shelf supported by projecting bricks above. The hearth area is of slate tiles. The walls are painted cream, the plasterboarded ceiling is white. There are small windows to the east and north-east in this room and two more substantial windows in the west wall. The pine stair leads up to a small landing that accesses an office space to NW and a bedroom to NE; a small bathroom sits to the S of the NE bedroom. Throughout the house the interiors are bright and generally painted in whites or creams. The kitchen interior is very modern and the kitchen/dining room areas are wood floored throughout. The kitchen area has been fitted with units to the north-east, east and south. In the centre of the north wall sits a Raeburn upon a hearth area of terracotta quarries. Previously there had been an Aga in this position and this was exchanged with the Raeburn when the previous occupants moved to their current house. 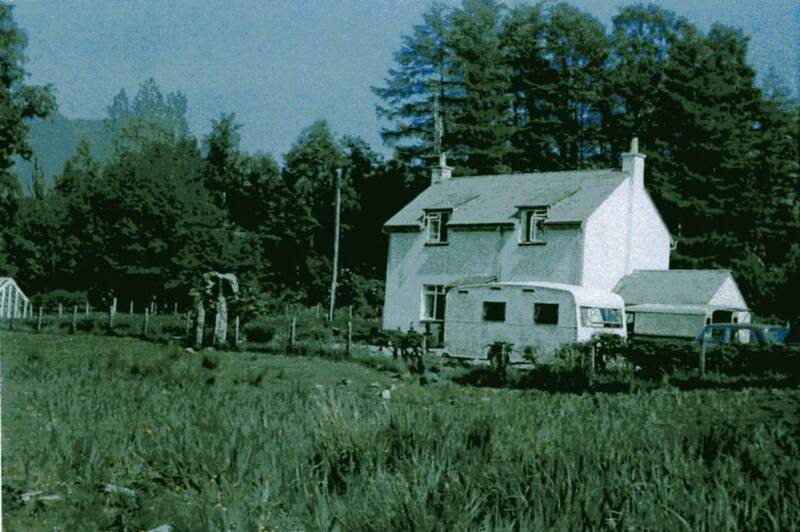 The Raeburn came originally from that house, which is located a little further to the west of Bathach Baan, called Ruba Beg. The Raeburn bears a mark with the crown above and says ‘Raeburn Royal’.